Jane Jordan, daughter of William Jordan and Blanche Fullerton, was born circa 1806, probably in Kanawha County, (West) Virginia, and died before 1847 probably in Tippecanoe County, Indiana. She married Francis Erwin, who had been born on February 17, 1800. After Jane‘s death, Francis and most of their children moved to Missouri, where he died on July 15, 1849 in Benton County, Missouri He is buried in Warsaw City Cemetery, Warsaw, Benton County, Missouri. Jane is possibly in the census of 1820-CabellVA in the household of William Jordan and probably in the census of 1840-TippecanoeIN in the household of Francis Erwin. 1. 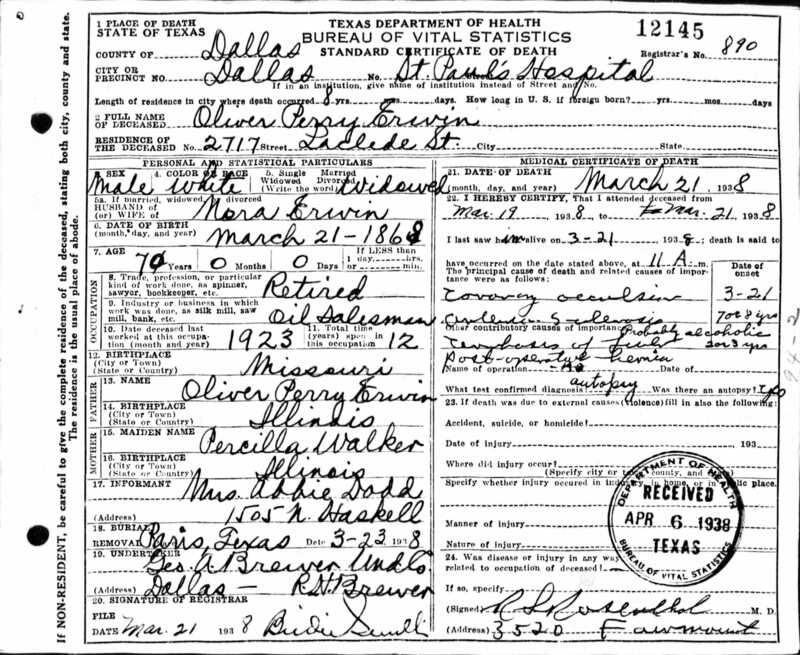 William Erwin was born circa 1827 in Virginia and died circa 1865 probably in Denton Texas. He married Mary C. Whillock, daughter of James Whillock and Deborah Rector. Mary was born in Tennessee in 1828 and died in Texas on January 14, 1918. She is buried in Clark Cemetery, Weatherford, Texas. 2. Robert L. Erwin was born January 24, 1830 and died on January 2, 1909 in Missouri. Married Eliza A. (last name unknown). Eliza was born in August 1835 and died on November 25, 1872. Both Robert and Eliza are buried in Hickory Point Cemetery, Pettis County, Missouri. 3. Marina Jane Erwin was probably born on February 27, 1832 in Indiana and died on February 1, 1903 in Jasper County, Indiana. She married her first cousin Isaac Blake, son of James Blake and Sarah Jordan. Isaac was born on April 20, 1824 in Virginia and died on June 17, 1905 in Remington, Jasper County, Indiana. Both Marina and Isaac are buried in Remington Cemetery, Jasper County, Indiana. 4. Salina Erwin was born circa 1834 in Indiana. 5. Blanche Erwin was born circa 1836 in Indiana. She married James A. Bradshaw on October 4, 1866. James was born in 1808 and died in 1901. 6. Perry Erwin was born circa 1839 in Indiana and died during the civil war. He married Priscilla Walker circa 1859 in Missouri. Priscilla was born circa 1838 in Wayne County, Ohio. 1 Proof that Jane Jordan Erwin is the daughter of William and Blanche is found in several court documents, including Tippecanoe County Final Record Vol 6 (pp235-237) November 1847, where her children are said to be the heirs of their grandfather, William Jordan. 2 Sources for Jane Jordan and Francis Erwin and their family include Tippecanoe County Court Records, Indiana Death Certificates, Texas Death Certificates, 1820-1900 U.S. Censuses, Benton County Missouri Court Records, and two very hard-working genealogists, Mrs. Barbara Hill and Mr. Robinson.